Sports Costs > How Much Does a Kayak Cost? A kayak usually fits one to two people and comes with a double ended paddle that allows for easy movement throughout rivers and lakes. Quickly catching on as a peaceful way to enjoy the waters, kayaks will be small, narrow and won’t have a motor. On average, a lower-end kayak is going to cost around $150 while a higher-end kayak can cost as much as $2,500+. The costs will depend on the type, brand, what it’s made from and the store you purchase it from. A simple injected plastic molded kayak can cost $1,000 to $2,000, while a fiberglass kayak can be costlier, retailing for $2,000 to $3,000 brand new. If the kayak is made from a carbon fiber material, the price can go up by more than 25% of a fiberglass kayak. Refer to our table below to see what popular brands will cost. An inflatable kayak, a kayak that can be blown up on the spot, can cost anywhere from $160 to $750. These type of kayaks don’t require a rack and can simply be blown up with a pump within a few minutes. A recreational kayak made from a durable plastic can cost $500 to $1,200. A regular, non-inflatable kayak can cost anywhere from $250 to as much as $1,500. For example, the Emotion Glide Kayak that fits one person costs $350 to $450, while the Advanced Elements Advanced Frame Kayak retails for $570 to $700. A youth kayak, designed for children under 12, can cost $120 to $300 for a simpler design. For instance, the Lifetime Wave Youth Kayak can cost $130 to $230. A fishing kayak, designed for those that want to fish smaller bodies of water, can cost anywhere from $250 to as much as $1,100. Ocean kayaks that are designed for bigger bodies and rougher waters can cost $375 to $1,200. These kayaks are also less prone to receiving water damage due to the salty ocean water. A transparent kayak cost, which has a clear bottom, can cost anywhere from $1,500 to more than $2,900. A two-person kayak can cost as little as $100 for an inflatable one to as much as $1,300+. Priceonomics.com says a kayak designed for rougher waters can cost $1,000 to $3,000. The website notes these kayaks will be lightweight and will be able to withstand the elements. They also are able to provide a lot of storage and adjustable seating. Fishing kayaks, as the name states, are designed for those who want to fish. These kayaks will have special fishing features such as rod holders, storage for bait and hatches for gear. Inflatable kayaks will be the cheapest option on the market and will be a great option for those who want something easy to transport. Just as the name states, these kayaks will inflate similar to a pool raft and can be stored in a simple storage bag. While some are performance-oriented, most will fall in the recreational category. The recreational kayaks will be ideal for those who don’t plan on paddling simultaneously and are commonly found on inland lakes, rivers and reservoirs. Compared to other models, it won’t offer much in terms of storage and most in this category will be made of either a hard plastic or will be inflatable. Sea kayaks will be longer, faster and are designed to go longer distances. These kayaks will be suited for oceans and/or larger lakes with a stronger current. Depending on how you use the kayak and which one you purchase, most will have ample storage and comfortable seating. Sit on top kayaks are similar to a recreational kayak but will be just what it sounds like. Instead of sitting in the kayak, you will sit on the top, offering a stabler ride most of the time. A touring kayak will be the shortest kayak on the market, measuring at eight feet. This kayak offers little storage space and is designed for those who want to use less energy paddling. Whitewater kayaks will be designed primarily for both calm and extreme whitewater. These boats will be made of very durable materials since the chances of running into jagged edges and rocks are high. Most kayaks will come with a warranty that can last anywhere from 90 days to as long as a lifetime. Some brands will include simple accessories such as a skirt, cup holder and paddles. While most kayaks are going to come with paddles, many people purchase a higher end brand that’s more durable. Higher-end kayak fiberglass paddles can cost about $150, while light carbon paddles can cost closer to $300 to $500 for the set. Life jackets are an absolute must and can cost around $15 to $90, depending on the brand. To transport a kayak from one point to another, a rack or carrier is going to be required for your vehicle. A rack for your car can cost $45 to $200, and this will depend on the size, how many kayaks you want to transport and your type of vehicle. A cover bag is suggested to keep the kayak from getting wet or damaged when sitting out in the sun or in the garage. Due to the kayak’s size, shipping one can cost anywhere from $60 to $100 if the retailer doesn’t include free shipping or if you want to ship it to a destination. 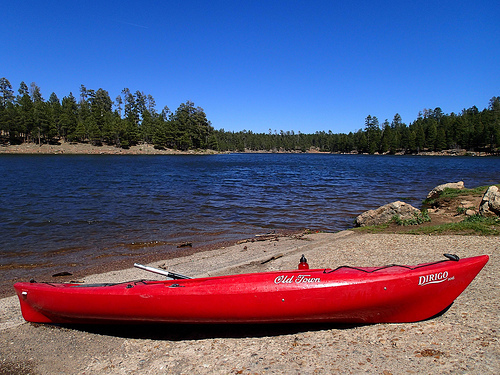 Some states may require you to register you kayaks if being used on public lakes. While there’s nothing wrong with a plastic kayak, fiberglass can be a better option since it has a longer lifespan when compared to a plastic material. Before purchasing any kayak, ask yourself where you’re going to plan on kayaking. A kayak designed for a small calm lake will be much different than a kayak designed for the open rougher waters. Plastic, lightweight kayaks will be designed for the smaller inland lakes, while ocean kayaks will be designed to hold up in the rougher and saltier seas. If a plastic kayak were to be taken out in the rougher waters, it could flip or even become easily damaged. Plus, fiberglass is a lot lighter than plastic, making it much easier to transport from one point to another. What size kayak do I need? If you plan on kayaking small lakes with no wake, something in the nine to 12-foot range will be just fine; however, if you plan on kayaking the open rough waters, then you may want a kayak that ranges 12 to 15 feet in length. Consider purchasing a kayak in the off-season. When you purchase used, you can save up to at least 30 – 40%. Check out Craigslist or eBay to see what you can find. Inflatable kayaks will be your cheapest option, starting at $200 or so, but keep in mind that even though the price is low, it will be a lot less sturdy and versatile than the other types mentioned above. These kayaks are ideal for beginners and should be used on smaller bodies of water only.